"I found Brubeck's work interesting until I heard Tatum, Horace Silver, and Oscar Peterson within a period of six weeks. But when I heard Horace, now that was a thing which turned me around and finally fixed my idea of piano playing." Horace Ward Martin Tavares Silver. As a child he was exposed to Cape Verdean folk music performed by his father, who was of Portugese descent. He began studying saxophone and piano in high school, when his influences were blues singers such as Memphis Slim, and boogie-woogie and bop pianists, especially Bud Powell and Thelonious Monk. In 1950 Stan Getz made an appearance in Hartford, Connecticut, with Silver's piano trio, and subsequently engaged the group to tour regularly with him. Silver remained with Getz for a year. By 1951 Silver had developed sufficient confidence to move to New York, where he performed as a freelance with such established professionals as Coleman Hawkins, Lester Young, Oscar Pettiford, and Art Blakey. In 1952 he was engaged by Lou Donaldson for a recording session with Blue Note; this led to his own first recordings as a leader and to an exclusive relationship with Blue Note for the next 28 years. From 1953 to 1955 he played in a cooperative band called the Jazz Messengers which he led with Blakey. By 1956, however, he was performing and recording solely as the leader of his own quintet, while Blakey continued as leader of the Jazz Messengers. 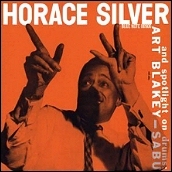 Silver's music was a major force in modern jazz on at least four counts. He was the first important poineer of the style known as Hard Bop, which combined elements of rhythm-and-blues and gospel music with jazz, influencing such pianists as Bobby Timmons, Les McCann, and Ramsey Lewis. Second, the instrumentation of his quintet (trumpet, tenor sax, piano, double bass, and drums) served as a model for small jazz groups from the mid-1950s until the late 1960s. Further, Silver's ensembles provided an important training ground for young players, many of whom (such as Donald Byrd, Art Farmer, Blue Mitchell, Woody Shaw, Junior Cook, and Joe Henderson) later led similar groups of their own. Finally, Silver refined the art of composing and arranging for his chosen instrumentation to a level of craftsmanship as yet unsurpassed in jazz. He is a prolific composer, and one of very few jazz musicians to record almost exclusively original material; his work consistently combines simplicity and profundity in a rhythmically infectious style which, despite its sophistication, sounds completely natural. Several of his compositions have become jazz standards, including "The Preacher," [mp3] "Doodlin'," "Opus de Funk," "Senor Blues," "Nica's Dream," "Sister Sadie" and "Song for my Father." A selected discography of Horace Silver albums. Horace Silver Trio, 1952, Blue Note. The Jazz Messengers, 1954, Blue Note. Finger Poppin', 1959, Blue Note. Blowin' The Blues Away, 1959, Blue Note. Doin' The Thing, 1961, Blue Note. Song For My Father, 1964, Blue Note. Cape Verdean Blues, 1965, Blue Note. The Hardbop Grandpop, 1996, Impulse!. Prescription for the Blues, 1998, Impulse!.